Sub-miniature in size, the SM3 Series snap-action switch is UL/cUL certified. 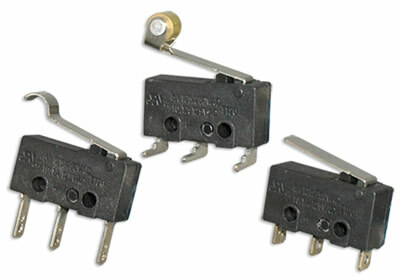 Actuator styles of this micro switch include pin plunger, simulated roller, short roller lever, long hinge lever and the standard hinge lever. The SM3 Series offers terminal options of .100? quick connect, solder lug, PC pin, right angle PC pin or left angle PC pin. Single pole switching options include SPST normally open, SPST normally closed, or SPDT.